Why Do We Teach Music Reading? To my surprise, I recently read a discussion thread by music educators on Facebook in which most of the participants found teaching music reading unnecessary. The argument for this position has been around for quite some time. Most of the world’s musicians, excellent musicians, do not read music, most of the world’s cultures do not use written music, and most people consume music as an aural commodity, not in written form. This last point is particularly interesting, because it is a relatively recent phenomenon. Before the arrival of recorded music, people experienced music in their homes by performing it with friends and family. They would gather around a home piano or organ and sing popular songs of the day, accompanied by a keyboardist who read from sheet music. All of the popular music hits were sold in sheet music form to meet the needs of thousands of home music makers. Music reading was also valued as a requirement for Christian worship. Hymnals were published with each hymn set in a four-part arrangement. Worshippers would read the music, singing their soprano, alto, tenor, or bass voice part. There were even singing schools set up in New England for the express purpose of teaching people to read music so they could accurately sing hymns in church. In this context, teaching children and adults to be proficient music readers was an accepted and necessary enterprise. In early twentieth century America, there was yet another practical reason for knowing how to read music. Symphony Orchestras were coming of age in the United States, and with them the need for trained musicians who could play the written music of the great European composers. When large numbers of European immigrants arrived in America, they brought with them their musical heritage. Playing this music in a time when no aural recording existed, necessitated music reading skills. It was therefore natural that music reading would enter into the curriculum of public schools. Music reading at that time was a desired life skill. Today, things are very different. Aural recordings of music have not only frequently replaced sheet music versions, they have also many times replaced going to live music performances. Whereas home music making was once the only option for enjoying music frequently, concert tickets being too expensive to purchase often, today high quality recordings, both audio and video, satisfy the musical desires of many people. 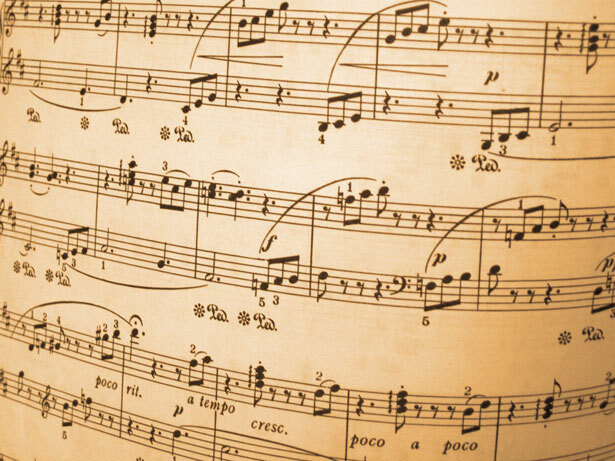 What’s more, with classical music not being as popular as it once was, the need for a notational system for learning long and complex musical scores often no longer exists. Most popular songs can and frequently are learned by ear, and for those songs that require notation to learn, simpler notational systems such as tablature and iconic notation meet that need without having to learn the traditional music notation used by and invented for composers and performers of European art music. So what purpose or need does traditional music notation meet for most students in the twenty-first century? What enjoyment of music does learning traditional music notation bring into a child’s life that cannot be gained by other means? Is the need for standard music notation a cultural one, present only in places where written traditions and not oral traditions are the norm? I believe that the need for standard music notation is greater in notational cultures. Speaking as an American, my aural skills are often in need of a written transcript to bring finer details to my attention. I simply do not notice as many fine details of music by just listening as I do listening while reading a score of the work to which I am listening. Were my mind trained at listening for and remembering in greater detail, as the minds of those in oral tradition cultures are, I suspect I would have less need of score reading while listening. But as it is, I enjoy and appreciate music more with the standard notation in front of me than without. So one need standard music notation meets is that it brings out the subtle details of music to a listener such as myself. A second purpose and need that standard notation meets is that it provides the means to convey the melody of a song. It is a frequent problem for me to easily have at my disposal the words and perhaps the chords to a song, but to not know what the tune is. Many times I find lyrics to a song I think I would like to teach or just sing myself, but there is no melody there, and no recording available to me. With a notated melody, and my ability to read music, I can quickly learn the melody with the words. A related need is that standard music notation provides a means for songwriters and composers to preserve their ideas and convey them to others where no audio recording equipment is available. This point is made clear by the famous audio recordings Bartok, Kodaly and other musicologists made in the early twentieth century. Without these audio recordings, many if not all of these songs would have been lost to all but those within the culture from which they emanated. The subsequent transcriptions of those recordings have brought those songs to music teachers and their students probably by the millions. While the original recordings were primitive and largely unavailable to the public, the transcriptions were publishable and accessible. What an important contribution that use of standard music notation has been. notation. Use these to teach the advantages and necessity of using music notation. My middle school students cannot remember from week to week what chords to play for the songs they enjoy performing on guitar, keyboard and drums, but they can get back to practicing and performing those songs immediately when they arrive at my class by going straight to the iconic notation. The key to teaching most things is to establish a need for learning first, then meet that need by teaching. Those students now understand the value of being able to come in and be up and playing right away, without having to listen and review and relearn each time. From there it is a small step to teach them that not all music can be accommodated in iconic notation, but the same benefits can be enjoyed using standard music notation. The point is made all the more clear when they create their own music and do not want to forget what they have composed. They are not allowed to use their cell phones in school, so the only method of recording their work is to write it down or memorize it. Acknowledging that they will not remember what they did a week from now, they have every reason to embrace standard music notation. One final thought here is that the issue can easily be overplayed. Where standard music notation is not the best representation of a musical work, do not try to force it in. For example, trying to teach a student to improvise by having them learn from notation transcriptions of great jazz solos is just working against ourselves. Jazz improvisation should be learned aurally, and cannot be adequately represented in standard music notation. 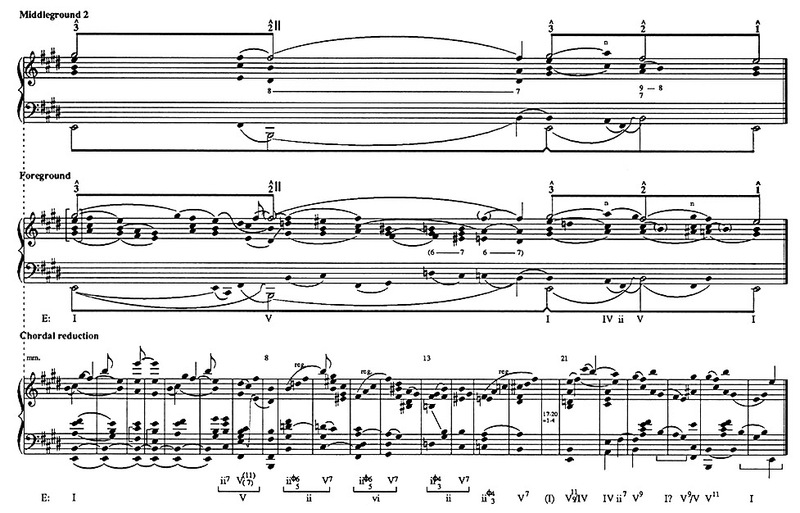 The notated versions are often awkward and difficult to read much less decode and perform. Similarly, there is no need to make a student read music in order to learn how to play a tonic-dominant-tonic chord progression. On the other hand, students should never be taught entire band or orchestral parts from wrote. 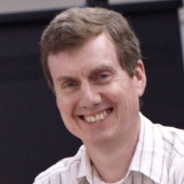 That is the kind of music our standard music notation was designed for, and all of its advantages should be realized in those ensemble settings. When standard music notation is used appropriately and wisely, the benefits, needs and purposes are clear to all involved, making the answer to my initial question, yes, we should teach music reading. When I used to go on family vacations, my Dad always had a map handy. He had it all folded so that the portion of the map he needed was visible while the rest of the map was folded underneath. Then, he’s hold the map so that the direction he was driving was facing the front of the car. That way he could easily see which way to turn. It was his way of translating a two-dimensional map into actions taken in three dimensions. With pianos, we have a similar problem. Music that goes up goes to the right on the keyboard, and music that goes down goes to the left. With the left hand, finger numbers that go up play notes that go down, while in the right hand, finger numbers that go up play notes that go up. Some have suggested that creating computer software that rotates the keyboard ninety degrees so that notes that go up go up, not to the right, is the answer, but eventually every pianist has to play a real piano, and no one I know can play one from the side. I would like to propose a more practical approach; one that likens reading music to reading a number line. On a number line, numbers that go up go to the right, just like notes on a piano. And on a number line, numbers that go down go the left, again just like on a piano. If numbers are used for note names instead of letter names or solfege, then playing notes on a piano can be just like travelling up and down a number line. As the numbers get bigger or “go up,” the notes sound higher in pitch or go up, and as the numbers get smaller or “go down,” the notes sound lower in pitch or go down. The values of the pitch numbers can be associated with relative highness and lowness in pitch, and our keyboard/number line moves in the familiar left and right direction. This also more accurately represents the science of what is really going on. As pitch gets “higher,” the frequency of the sound increases. For example, the frequencies of the eight pitches in a one-octave C major scale are C(^1)=261.63, D(^2)=293.66, E(^3)=329.63, F(^4)=349.23, G(^5)=392.00, A(^6)=440.00, B(^7)=493.88, C(^8)=523.25. When we say a pitch is going up, what is really being described is a pitch that has a higher frequency than the preceding pitch, and is representing by point on a number line to the right. When saying the music went up, we make an abstraction of what we hear going in an upwards direction in space, but this is not in fact what is physically occurring. This abstraction is represented in our standard musical notation by placing the note that went “up” higher on the page (or closer to the top of the page) than the preceding note. Of course we don’t teach young children about frequencies, but we do teach them how to count, and a number line is a tool for doing so that many of them are familiar with from their classrooms. Seeing the piano keyboard as a number line is an easy transfer for them. A number line can be made and set beyond the black keys leaning up against the back of the keyboard and referred to during practice and teaching sessions. The number line can be moved so that it aligned with any tonic, and is used as tonal syllables, with the tonic always aligned with “1.” When pitches are sung, the student still uses fixed do, but when they are played, he or she thinks of them as numbers on the number line. If the teacher prefers to retain letter names for notes, a “letter line” can be used instead, and the student can be taught to think of letters going up and down as number do. By establishing up and down as a function of numerical values attached to pitches, the left to right reading of a line of music can be disengaged from pitch direction, avoiding the contradiction of up/down versus left/right. Teaching intervals to music students is on of those concepts that can easily be either overlooked, or if taught make students wonder why. Like most concepts in music theory, if intervals are just taught but never applied or made practical, there really is very little to recommend teaching them. On the other hand, teaching students what intervals are, how recognize them, and how to use them to improve their sight singing and music reading is an important part of building musicianship in music. Before going further, I should define what is meant by intervals. 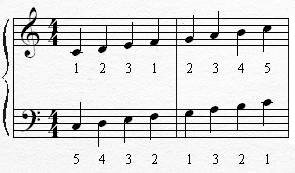 In music, an interval is a numeric value that represents the diatonic distance between two pitches. To determine the interval, one counts the first note as 1, and then counts up in increments of 1 for each possible diatonic pitch up to and including the second pitch. For example, from do to mi is a third, because do is counted as one, re is counted as two, and mi is counted as three. Do to sol is a fifth, re to ti is a sixth, and so forth. Not all like intervals are the same size, but when audiated and sung, their differences become apparent aurally in the context of a diatonic scale. Labels of major, minor, and diminished can be applied when the differences in sound have become familiar. One of the best uses of intervals is to sing scales in different intervals. This is excellent ear training. The most common interval for this use is the third, and singing a scale this way is known as singing a scale “in thirds.” A C major scale ascending in thirds would have pitches of do, mi, re, fa, mi, sol, fa, la, sol, ti, la, do, ti, re, do. The descending scale is do, la, ti, sol, la, fa, sol, mi, fa, re, mi, do, re, ti, do. Other intervals are useful as well. Scales in fourths and fifths and seconds are wonderful for developing solfege skills. On instruments as well as on voice, they also promote even tone across leaps and shifting registers. the five-line staff are always entirely on lines only or spaces only, while the sub dominant will be on the opposite. This helps in recognizing the sub dominant chord because it is the chord that is located differently. Students can also be taught to recognize arpeggiated chord inversions using intervals. A chord in second inversion has a fourth between the bass note and the tonic, and a chord in first inversion as a fourth between the third and fifth of the chord. Once students are proficient at audiating intervals, they can more easily read them using rules for specific intervals. Among these is that thirds always are space to space or line to line, fifths always go space to space or line to line with one of the same in between, and fourths have a space and a line between the two notes. Recognizing thirds, fourths and fifths quickly is a great advantage, because our diatonic music is loaded with chord patterns. Seconds are an indication of non-chord tones, and a cue for students to look for the chord notes to correctly audiate the harmony. Intervals are also an important piece of data that our brains use to identify melodies. Along with rhythm, most people will quickly “name that tune” as soon as the interval combination (as opposed to the sequence of individual pitches), meter and rhythm are known. 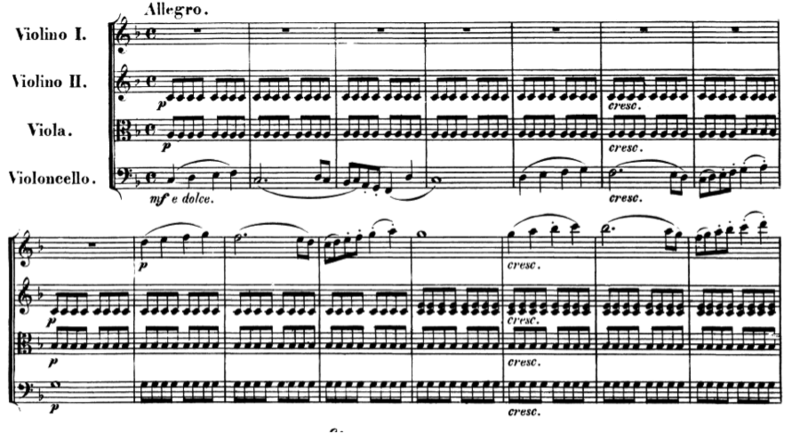 For example, do fa fa fa with a rhythm of quarter, dotted-eighth sixteenth, quarter is almost universally recognized as “Bridal Chorus” from Lohengrin if it begins on the downbeat in common time, or as “O Tannenbaum” if it begins on the anacrusis in 3/4 time. And although most people could not name the pitches involved, nearly everyone can recognize two unisons and a descending major third as the opening of Beethoven’s fifth symphony. It is also true that often the sound of particular intervals are remembered by a well-known excerpt in which they are found; the fourth sounds like the beginning of the Bridal Chorus, the major third sounds like the beginning of Beethoven’s fifth symphony, and so on. Of course, these are only aids to building audiation skills; eventually students should be able to just audiate intervals without relying on such references. Teaching intervals in a practical way makes them useful and relevant to students, and places them in the correct context for most students. While being able to identify or “spell” intervals is good, it is of little practical value without putting intervals to use in performance and music reading. For those who analyze scores, there are other applications of intervals, but for most school children, the more relevant and practical approach is best. You’re The Guide, Now Where Are You Taking Them? When I write my lesson plans, a lot of thought goes into stating a goal, finding materials, and ordering everyithing into what I think will be an effective progression of steps that will guide my students through the lesson and what I want them to do, leading them to the destination of the goal. While it is necessary for me to think through all of this before I teach the lesson, if I don’t share my reasoning with the class, they may not connect the dots as they progress through the lessons, and some learning may not be lost. I’ve found that while it is good to share the goal with the class, this alone is often not enough. Just because students know what they are to be able to do by the end of the class doesn’t mean they will pick up on their own what each step along the way has to do with achieving that goal. When I explain at the beginning of the class, not only what they are going to do, but why they are going to do each task, and how it will advance them closer to achieving the overall goal, students are noticeably more motivated and more engaged in the lesson. Let’s see how this looks in a class I recently taught. The goal was that students will be able to use standard music notation to improve their efficiency at learning a musical work. The music was a piece the class had already practiced singing, though it was not completely learned. I began by telling the class that they would learn how to use a musical score to gather information about a piece, and to assist them in learning the music faster than just by listening to it. i then distributed copies of the vocal parts to the first page of “Dry Your Tears, Africa” by John Williams. I reminded them that this was a song they are already familiar with, and then told them they had two minutes to gather as much information as they could just from looking at the music. After two minutes, they began telling me what they found. First came pitches, rhythm, and meter, then the words and the fact that the text was in a language other than English. One student said the title suggested the song had to do with sadness because of the word “tears.” Another student was able to notice that there were two voice parts, and that they were soprano and tenor. By the end of this discussion, everyone was aware of the wealth of information that was available to them by looking at the score, and most of which had been overlooked by just learning the music by ear. Next, we began to apply what we had found to performance. We had discovered that rhythm was one of the many things written in the music. The rhythm of the song was simple; all quarter, eighth and half notes, so they tried clapping the rhythm from reading. It didn’t occur to them to think of how the song went while they read the rhythm, so their first attempts were more imprecise than I anticipated. Then a few of the students thought of singing quietly while they clapped. I recognized this as a good idea, and the whole class did the same. Now with the notation and their performance melded together, first their clapping became more precise, and then their singing became more precise. As they became aware of how their singing and clapping were not together, they realized that both needed to be more precise and brought into agreement. Once this was done, their performance improved dramatically. As we worked our way further into the music, I told them to apply the same strategies as they practiced a less familiar section of the music. While they were tempted to just keep singing the section, thinking repetition would result in improvement, I encouraged them to use the notation to read the rhythms they were unsure of. We reviewed the use of slurs to connect notes that are sung on the same syllable, and checked to be sure we noticed all of the notes included in the longer melismas. Slowly, as they shifted their approach from learning by ear to learning form notation, their performance began to improve more quickly, just as I had told them it would. Because everyone likes expediency, they were now gaining enthusiasm about using music notation. By the end of the class, they had used music notation to a delve deeper into the music, and had learned many uses of notation in learning music, and learning about music. When I was in elementary school lo those many years ago, there were a few years when I had trouble with math. I tried really hard, and spent a lot of time at home trying to get it, and practiced many strategies for understanding concepts and coming up with the right answer. Sometimes, after I had exerted great effort, I would come up with an answer, and be delighted to have done so. It never occurred to me to think about my answer to make sure it made sense. As a result, Johnny, after starting with five apples and eating two may have had 325 left on a few occasions. It took a patient teacher to point out the impossibility of my answer, no matter how much effort I had exerted. I could have used a little common sense to help me learn math. Eventually, having physical objects in front of me, and removing two from a collection of five led me to understand that Johnny must have had fewer apples after eating some than when he started, and that he had only three left after his snack. Seeing real objects made the abstract numbers meaningful. The same applies to music. Last week, I taught a lesson on phrase structure. I had my students mark the phrases in printed music of “Jingle Bells.” I chose that song because I knew they all were familiar with it, and would be able to use their familiarity with the melody to find the phrase structure. I gave them four things to look for. I told them new phrases begin after relatively long notes or rests, when a rhythm pattern starts over, when there is a sudden change in dynamics or articulation, and that all of the phrases would be the same length. While most students were able to correctly using the phrase structure using these principles as guides, some misapplied them, and gave an analysis that made sense to them on paper, but not when I sang the song to them pausing at the places they claimed the phrases ended. “Oh what fun it is to” I sang. “Does that make sense, to pause there?” The student instantly recognized that it did not make sense, and quickly found the correct location of the end of the phrase while listening to the music, and was able to mark the phrase correctly in the printed music, showing that they did have enough reading skill to mark phrases in printed music. It did not occur to the student to employ the strategy of singing this familiar song while following the notation in order to find where one phrase ends and the next begins. They trusted what they thought about what they saw without checking their answer against some common sense. “If I have marked the phrase correctly, if I pause at that point, it will sound right, like a pause belongs there.” Because the student did not or could not connect what was read with what was imagined or heard, what was read could not possibly make any sense. This brings out a fundamental problem encountered in learning: the connecting of everyday experience with abstractions of them. Written symbols, whether musical notes or words of a language are not the things themselves, but abstractions of them. The word “chair” is not a chair, but refers to a physical object we know as a chair. I am sitting in a chair now as I write this, but the word “chair” is on my computer screen, not under me. In the same way, a note is a sound with a certain pitch and a certain duration. It is something I hear, and it is caused by a physical thing, a sound wave, activating my ear and sending electrical impulses to my brain. This note is in the air or in my imagination, but not on the printed page. That note, on the page, is an abstraction of the real note. Understanding the abstraction, the written representation, is a matter of connecting experience with what is written. When the two cannot be reconciled, then one is in error; either what is written does not accurately represent what I have heard, or if I am reading, I have heard or imagined something other than what is written. In order to accurately read music, we must be able to “check our work,” making sure that the two do indeed match. If every student learned the same way, and that one way was the same way you learn, then teaching would be easy. But as we all know, everyone doesn’t learn the same way, and we as teachers must be alert to how our students are trying to learn, and learn from them how to teach them. This may sound odd to some teachers. “Do you mean that I’m supposed to ask my students how to teach them?” Yes, in some cases, that is exactly what we need to do. Success in school should not be dependent on whether or not a child happens to have the same learning style as the teacher. Many students struggle not because they lack ability or effort, but because they just can’t think and reason in the mold we have given them to work with. Today in one of my 8th grade music classes, I was given the opportunity to learn how a student was trying to learn, and then to adjust my teaching accordingly. The result was, the student succeeded where she had been unable to succeed before. I then went over the “landmark” keys on the keyboard of C and F; landmarks because C is before the group of two black keys and F is before the group of three. I asked her to remember those two notes, and then start to remember where the other notes are in relation to them and the black keys. I then played the melody while she watched. Instead of trying to memorize what I was playing, I asked her to simply name what note I was playing at any given moment by watching my hand. 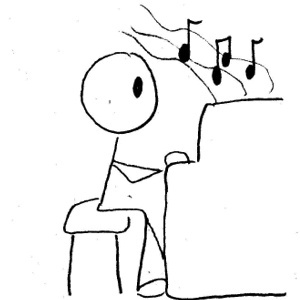 As she did so, she began to connect her memorized sequence of note names to the piano keys. I then asked her to memorize the notes in groups instead of individually. It starts with two G’s followed by one B-flat, so we made that our first group. Eventually, she made the first group all of the notes in the first phrase except the last two. That was useful, because the second phrase is an exact repeat of the first phrase except for the last two notes. It was then easy to remember the last two notes of each phrase. Quickly the first two phrases were learned. Then, from what she could play on the piano, she could recognize what she was reading in the music. It was kind of like a modified “sound before sight” with the modification being playing the “sound” part included memorized pitch sequences partially learned from notation and partially learned by watching me play. She needed more visual learning than “sound” would allow. With her strength being visual learning, she may turn out to be one of the strongest music readers in the class. I will continue to match piano keys with what she is hearing after she has practiced naming the notes from notation. Eventually, I will try to merge the two so that she is hearing from notation while naming the notes and transferring the heard and read notes to the keyboard.